I just watched Tony Blair leave Prime Minister’s Questions having received an unprecedented standing ovation from all sides of the House. The Reverend Ian Paisley gave a moving tribute to the Prime Minister with kind words also coming from David Cameron, Menzies Campbell and Labour MPs. 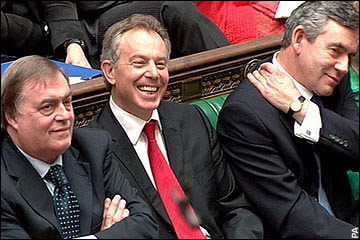 I like Tony Blair. I attended a “goodbye” meeting for him last week along with lots of other London Labour Party members. He got a similar reception. He has been a giant figure on the UK and World stage. There will be many commentators of all persuasions putting forward their views on his record but I, for one, believe that he goes from his job leaving the Country a kinder place and in a much better state than he found it. That’s a fine legacy for any Prime Minister.